A meeting between state Rep. Eric Johnson, D-Dallas, and Texas Gov. Greg Abbott over Confederate monuments on Capitol grounds ended with the governor supportive of removing a controversial plaque, according to Johnson. But Abbott's office quickly disputed that account. "The governor did not agree to remove the plaque. He's having the board look into it," spokeswoman Ciara Matthews said, referring to the State Preservation Board which oversees Capitol grounds. 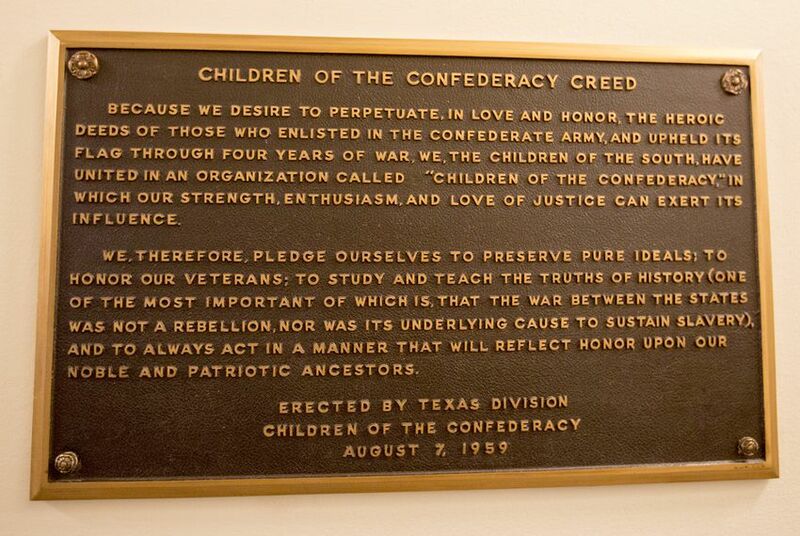 The meeting was arranged after Johnson publicly called for the removal of the “Children of the Confederacy Creed” plaque, which was erected in 1959 and is located outside his Capitol office. The plaque asserts that the Civil War was “not a rebellion, nor was its underlying cause to sustain slavery." “The governor has committed to me that he wants to have the State Preservation Board look into what the procedure is for removing the plaque because he agrees that it’s historically inaccurate and he does not want historically inaccurate information on display in the Capitol,” Johnson said after the meeting. Matthews, Abbott's spokeswoman, described the meeting with Johnson as "productive." "They talked about ways to increase employment opportunities, increase educational opportunities and improve the lives of African-Americans in Dallas and across the state of Texas," Matthews said. "On the plaque, the Governor told Rep. Johnson he would ask the State Preservation Board to look into the issue, specifically the history of the plaque, as well as the history of the removal of a similar plaque at the Texas Supreme Court." Johnson previously said the plaque “has no rightful place in the Texas Capitol,” adding it “is not historically accurate in the slightest, to which any legitimate, peer-reviewed Civil War historian will attest.” The plaque is one of about a dozen Confederate markers or monuments on the Texas Capitol grounds. During Friday's meeting, Johnson said his conversation with the governor focused specifically on the plaque though he vocalized his opposition to all Confederate markers on Capitol grounds. Just three days before Johnson and Abbott met, the Dallas Democrat penned a formal request to the State Preservation Board to remove the plaque. “I have taken every step legally necessary to request that this historically inaccurate plaque be removed from the Texas Capitol," Johnson said in a letter dated Oct. 23. "It’s now time for the State Preservation Board to act, and I look forward to its favorable and expeditious consideration of my request." Abbott has previously said removing the monuments "won't erase our nation's past, and it doesn't advance our nation's future." Removing Confederate markers from the Capitol is an issue that has crossed party lines. In September, House Speaker Joe Straus, R-San Antonio, echoed Johnson’s request that the plaque by removed in a separate letter to the State Preservation Board. "This is not accurate, and Texans are not well-served by incorrect information about our history," Straus said of the plaque. He added that “Confederate monuments and plaques are understandably important to many Texans" but stressed the importance of such landmarks being "accurate and appropriate." Abbott’s meeting with Johnson is part of a larger conversation — both statewide and nationally — surrounding Confederate monuments. After a march defending a Robert E. Lee monument in Charlottesville, Virginia, erupted into deadly violence in August, some confederate statues in Texas quickly came down after years of debate, including three at the University of Texas at Austin and one in a public park in Dallas. Despite this, most Texas voters say they don’t want to remove Confederate monuments or put them in museums. According to our latest UT/TT poll, 22 percent think they should be left in place but with added historical context, while 34 percent say they should stay unchanged. Johnson, who has long tried to start a conversation on the issue, said after Friday’s meeting he is "confident" that Abbott and the State Preservation Board will remove the plaque. Still, there are more than 180 public symbols of the Confederacy around Texas, including about a dozen on Capitol grounds.